A sense of being overwhelmed has pervaded recently. Resulting in a temporary blip in blog postings. Although currently in the re-fueling stage, I’ve already got the map out and am planning the way forward. Setting pace has always been something I struggle with. But at least I’m quite good at writing lists. It’s also the time of year when I pause, re-evaluate and plot something of a course for the next one. It’s been a pretty amazing year in all consideration – and it’s still less than a year since graduation. First things first – I’ve got a project that needs finishing up. But momentum is building, and I am resisting the temptation to fill my temporary studio (location – top secret) with things. I am somewhat limited to what I can carry from the car park and up the stairs, which is both a suitable hint at it’s location and an encouraging factor in not moving in entirely. A slight step back to re-examine materials, to experiment, test, push my luck are all key factors. It is also an opportunity to work without direct consideration for anyone else, temporarily, this is a bit of a relief (though I suspect it will pass). The temporary studio is also giving me big ideas for next year, it’s taking a while to project myself forward more than a month – but at this rate it’s impossible to keep up without more of a long(er)-term goal (I reckon six to eight months in advance is probably plenty at this stage). I’ve found a whole host of new obsessions, one of which is quite mostly salt. 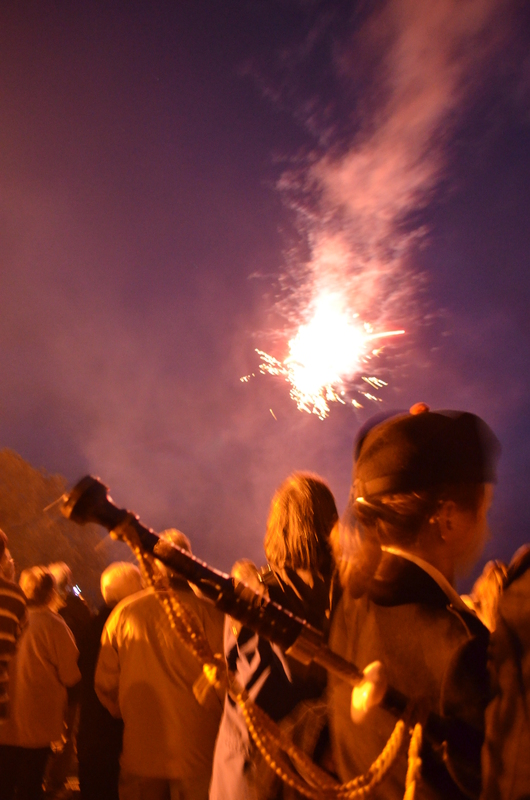 The Wigtown Festival 2013 has passed. It is a marathon of a festival – the excitement, the exhilaration, the festival buzz – there is a certain required stamina to manage all ten days (I did not). In the run up to the festival it felt like the town was bracing itself against the onslaught. Indeed, an onslaught there was. 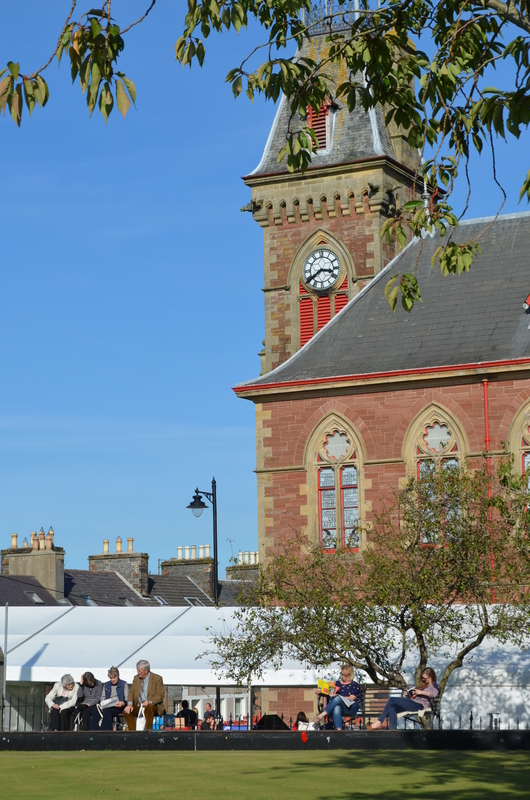 The preparation spread through the festival team, around the County Buildings, out into the streets, through the cafes, bookshops and into the surrounding wildness – Wigtown was coming alive! The festival came in waves, largely weekend waves – from the Festival Launch party through to Joanna Lumley hysteria – but it was an unstoppable tide of amazing, inspiring authors, speakers, performers that brought in the crowds on the surf. It’s somewhat refreshing that the big branded coffee stores and sandwich shops have not made it to Wigtown. Their tendrils are spreading into towns previously considered too small to need a Gregs, Subway, Costa, or Starbucks competing with local businesses. And the local businesses hold their own – there is a fantastic array of food on offer – veggies need to make the stop at the Reading Lasses, baked feta starter being one of my highlights, but the equally lovely Rendez Vous Café does an AMAZING lemon and poppy seed cake, and Beltie Books gave me the most beautiful homemade rhubarb and ginger jam with my scone – I really did eat my way around the festival. The Random Book Club cries power to the shop local movement – based from The Bookshop, Wigtown’s largest – annual membership rewards a hand-picked book randomly selected from their shelves each month and posted to you, taking a clear stance against the Amazon’s of an internet age. From shop local to power local, one of this year’s themes for the book festival Scotland 360, launched the Independence debate into the heart of the programme, with talks from Lesley Riddoch, Malcom Fraser and renowned land rights activist Andy Wightman. With Wigtown falling under Dumfries and Galloway council, a near 60 miles away, devolving power down to localities was a hot topic over the festival – inspiring possibility and grassroots change was the flavour, with conversation set to flow towards September 2014’s referendum. The Book Festival finds itself interconnected with it’s surroundings. Wigtown is a forgotten world away from the cultural centres of the big cities to the south and north – a point noticed by many authors on long journeys here. One conversation has stuck when one London based author found herself walking back to her B&B in the dark – a point entirely missed out by a country bumpkin highly unused to the street lighting of Wigtown’s main streets in her own woodland home. Events brought literary fans out into the Galloway wilds; bird watching along the old railway line, visiting St Ninian’s Cave and night-time cycle rides all featured as part of the Natural Scotland programme this year. It maybe seemed inevitable that both Astrid Jaekel, artist in residence for the festival, and myself with my phone boxes would explore into the community to try and get a sense of the place deep down. I heard stories of those evacuated to Whithorn narrowly missing the Clydeside bombings, tales of primary schools in rural areas, snowy winters, forgotten faces. Occassionally, our points of reference may have over-lapped, but outcomes set the work apart. I may have despaired with the regularity I heard the word quaint used over the ten days in Wigtown – it doesn’t really do justice to the efforts of the Wigtown community. It feels as a community collective making waves – reaching out to the wider world. And best wishes to them all – it can be no easy feat bringing in audiences from the Central Belt and from the South to a small place – both geographically and politically out on a limb. It’s no mean feat, and I’m already looking forward to next year.